TRACE MODE offers development technologies of the new generation! In order to understand the difference of the new TRACE MODE technologies, let us remember how a control system is being traditionally developed. If you use the previous generation technologies for control system development, then in order to measure 1 value (e.g. temperature of oil) you are constrained to: first of all make a program in PLC for reading an analog input, then you create a tag in the OPC-server to read the value from the PLC, after you will make a tag in the HMI program, to read the same temperature from the OPC, and after all if the oil temperature value is used to make decision about maintenance or inspection, another tag should be created in the EAM application. That results in loss of engineering time, additional expenses for software tools and for related trainings, moreover they reduce the overall system reliability, due to the higher probability of errors in applications and in connectivity. TRACE MODE is based on the revolutionary technology of integrated project development. It means that only one tool is used for automation of any production processes of the enterprise – the TRACE MODE® Integrated Development Environment. The control system, operator HMIs, PLCs, and manufacturing automation IT systems could be developed in one development environment and within the frameworks of the single project. Such approach eliminates unnecessary duplication of databases for PLC, OPC-servers, operator HMI workstations, production equipment, personnel, production information, etc., saves engineering time and reduces errors. More than ten editors are built-in into the TRACE MODE® 6 integrated development environment, which open automatically upon call of the project component. All TRACE MODE editors use the same project tag database, that means that the tags are input only once and then are many time reusable in several TRACE MODE applications. Development of control systems in the TRACE MODE® 6 integrated environment is quite easy! Create a sensor (hardware-controlled tag) in the section of "Sources/Receivers", connect it to controller, and then drag and drop the object onto the icon of HMI Real Time Monitor (RTM) – information from the sensor would be output to the HMI workstation. Drag and drop the same object onto the Pump icon of the unit of T-Factory EAM (enterprise asset management) and a channel is created, which monitors operation of the equipment, counts downtime, and manages technical maintenance and repairs. Now again drag and drop this object onto the unit of T-Factory MES (manufacturing execution system) and now, a channel is created, which calculates the amount of products manufactured, its prime cost, and computes material balance. 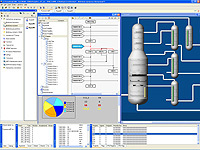 In all cases we used one source of process control information and connected it to different TRACE MODE® logical structures. This allowed us to create in a few minutes an integrated information system, which includes both the process control system and manufacturing automation. Moreover, neither information, nor operations were duplicated. Information enters TRACE MODE® only once, and then it is used repeatedly in control system by the various modules of the integrated development system. The logic structure of the control system project in TRACE MODE® is fully separated from the hardware. Due to the unified database of distributed variables and 100% object approach, the variables available from the various project nodes (PLC, SCADA/HMI, workstations of MES, EAM, HRM) can be used by the designer as easy as those related to the local node. Any changes made with one object, are automatically applied everywhere it the project. In some control system projects such technology rise productivity 10-20 – fold! Integration of business-systems with real-time control system supports the management and technical decisionmaking with objective information obtained in real time and thus increase the quality and efficiency of production management. Current TRACE MODE release 6.10.2. Upgrade now for free! AdAstrA Reseases a New Milestone Release, SCADA TRACE MODE 6.06!